This elegant, evergreen is commonly known as a Cider Gum tree and will grow to an estimated height and spread of 10 x 10 metres in 20 years. 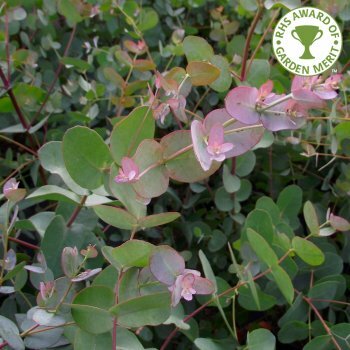 Eucalyptus Gunnii produces rounded, silver-blue new foliage which turn shades of grey-blue and green as it ages. The bark of the Cider Gum Tree peels in a variety of chalky shades, including creams, greens, grey and browns providing another striking feature. Eucalyptus Gunnii prefers a South facing position and can tolerate all soils but is happiest in moist, well-drained conditions. A stunning evergreen tree, Eucalyptus Gunnii will provide screening and interest year round. Our pot grown Cider Gum trees can be planted at any time of the year. Start by removing all weeds and grass within a metre of your intended planting hole. Dig a square hole as deep as your root mass and approximately 2x as wide. To help your tree establish more effectively, especially if you have poor soil, we advise sprinkling root grow in the hole. Take the pot off and gently loosen the roots, then place into the planting hole. Mix 50% of the original soil with 50% compost, then fill in the hole and firm around gently, making sure not to bank the soil up around the collar of the tree. We recommend using a stake and tie kit and, if your area is prone to rabbits, a spiral rabbit guard too. For further information, visit our help and advice section. If you’re planting in spring, summer or dry weather, water well and regularly for the first few months. Make sure to keep an eye on young Cider Gum trees and increase watering if there are extended periods of hot or dry weather. If you’re planting in autumn, you may only need to water your tree a little. Once planted, it is important to keep the area free of competing weeds and grass for the first couple of growing seasons. Cider Gum trees require formative pruning in the first few years. This should be carried out between February and March. The key thing to remember when pruning a Eucalyptus Gunnii tree is to never cut the central leader stem. During the first 3 years, prune as follows: remove the side branches from the bottom third of the main stem. Prune half of the length from the sideshoots on the middle third of the main stem. Only remove damaged or overcrowded branches from the top third of the stem. After the first 3 years, maintain a clear trunk by pruning any side shoots.